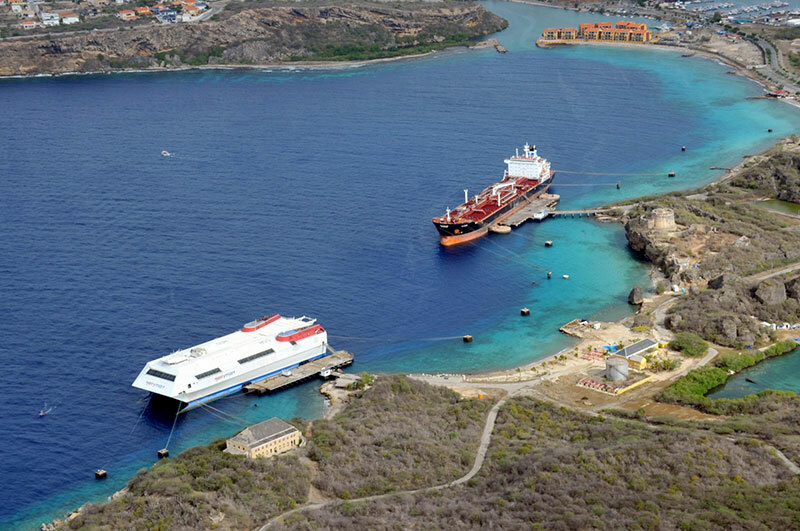 The ports of Curaçao are all natural sheltered ports that offer safe, fast, and reliable handling of ships and cargo. The ports available for commercial purposes are: Willemstad, Fuik Bay, Caracas Bay, Bullen Bay and St. Michiel’s Bay. The centrally located ports, which are outside the major hurricane routes, offer many competitive advantages; modern infrastructure combined with Dutch know-how, guarantees the best possible service for shipping and cargo handling. The Port of Willemstad is the main and largest port of Curaçao, housing a wide variety of maritime facilities for all types of vessels. 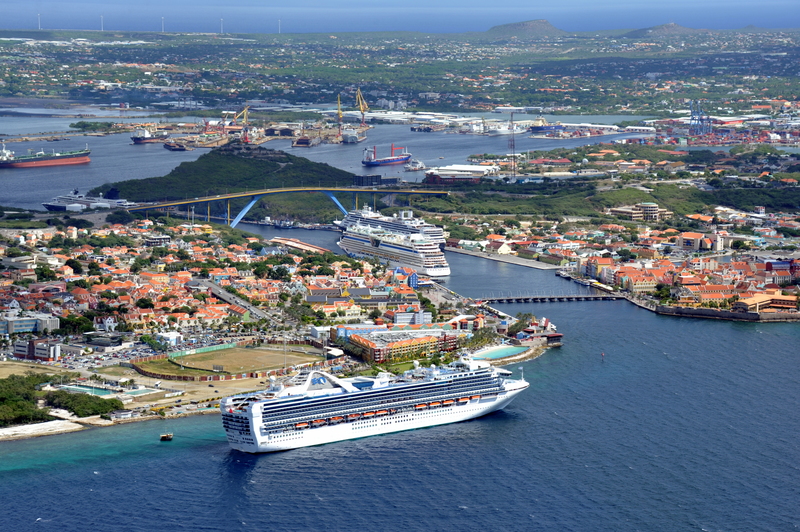 The entrance channel to this port, the St. Anna Bay, is situated in Willemstad, the capital of Curaçao. Cruise ships and other vessels dock at the Megapier Cruise Terminal at the entrance of the bay and at (cruise) terminals located at the Otrobanda side of the bay. At the end of its entry lies the Schottegat area, which houses the main facilities of the port including the region’s largest oil refinery and dry-dock, an economic zone area, the container terminal and cargo wharves. All these facilities are located directly in the harbor. Pilot: Compulsory for vessels of 50 GT and higher. Anchorage: There is an anchorage area in the Port of Willemstad, in the southwestern part of Schottegat, with a dolphin with a mooring buoy on each side. This area is available as a waiting berth, subject to the Harbor Master’s permission, with a depth of 12.19m. The distance between each buoy and the dolphin is 348m. Principal navigation aids: A Light, Lat 12’07. O’N, Long 068’56. 0’W (Orange column, black bands, 7.0m in height), is occasionally exhibited on the East side of the North end of the St. Anna Bay. Charts: BA 702, 1412. Dutch 2714. Admiralty Pilot NP7A. Restrictions: St. Anna Bay is crossed by two bridges, the Queen Emma floating pontoon bridge, and the Queen Juliana fixed bridge (55m high). The pontoon bridge opens day and night for incoming and outgoing vessels. Berths: There are berths on both sides of the St. Anna Bay, North of the pontoon bridge, with depths varying from 5.4 to 10.0m alongside, generally used for bunkering and passenger ships. The Megapier Jetty lies 200 meters to the west of the St. Anna Bay and has a draft of 15m directly in front of the jetty. Being outside the bay, the Megapier Cruise Terminal is not subject to the St. Anna Bay restrictions. Cargo facilities: The container terminal has a draft of 12.2m and is equipped with 2 gantry cranes with a capacity of 50t and has a rated throughput of 30 to 35 moves per hour, with an outreach of 37.49m and a back reach of 16.15m. General cargo is handled with the ship’s gear. The facility can accommodate Ro/Ro and Lo/Lo. Storage facilities: There are several covered and open storage spaces available on the wharves to load or unload ships, mainly dry cargo. Repair and maintenance: A wide range of facilities and services, are available by way of dry and wet operations with a maximum allowable depth of 10m. Maximum graving dock dimensions are 280m x 48m. Conversions and engineering are supported by international standards. Bunker facilities: Seven berths are equipped to supply all fuel-grades and ex-pipe bunker facilities are available at nine jetties. Fresh water is available at most berths and jetties. Barges: There are several barges available. Ballast/slop reception: Available. Slops containing chemicals will under no circumstances be accepted on shore. Bullen Bay is an open and spacious bay located on the Southwest coast of Curaçao, eight miles northwest of Willemstad. At this bay, the biggest vessels can enter safely. Built by Royal Dutch Shell, it is now partly leased and operated by the Venezuelan oil company PDVSA as a storage and supply facility for the Emmastad refinery. Transshipment of crude and products are also carried out from this bay. The terminal was built to facilitate economical transshipments of 1,200,00 b/d of Eastern Hemisphere crude arriving in “Very Large Crude Carriers” for storage and subsequent carriage by smaller ships to draft restricted U.S. ports. Crude can be transported from the storage tanks through pipelines to the refinery in the Port of Willemstad. Bunkering and underwater cleaning are also available at Bullen Bay. Pilot: Compulsory, Pilots are provided by Willemstad. Tugs: Compulsory, Two tugs are stationed in the terminal. Anchorage: There is no anchorage in the bay. Principal navigation aids: Leading lights and lighthouse. Restrictions: No normal navigation restriction. Berths: Bullen Bay has 3 V.L.C.C. T-shaped jetties. The largest jetty is only 110m offshore and can accommodate vessels up to 70.000 DWT. Storage Facilities: Crude oil, fuel oil and products terminal. Total capacity is 17,750,000 barrels. There are facilities to store and transship heavy, heated crude and fuel oil. The storage consists of three tanks of 375,000 barrels capacity each. The maximum storage temperature is 90°C. The system is able to provide segregated storage for different grades. Barges: Available from Willemstad on request. Bunker Facilities: There is equipment for all grades of fuel available at a rate of 3,800 barrels per hour. Fresh water: also available at the piers. Ballast/slop reception: Deballasting and slop reception facilities available. Caracas Bay is located on the South coast of Curaçao, 8km SE of Willemstad. Caracas Bay was a former oil terminal, which was dismantled in 1996. This open and deep water bay is easily accessible from open sea and ideal to berth large vessels and other floating objects. Due to the crystal clear water, more and more ships use Caracas Bay to perform inspections, repairs and underwater cleaning. This natural, deep-water bay includes two sheltered deep-sea piers, which can accommodate ships of every type and size. The piers can handle passenger vessels and they are naturally protected from wind and sea. The Caracas Bay Peninsula offers exciting possibilities for nature and water sport fans and is now awaiting tourism development. Pilot: Compulsory for vessels of 50 GT and higher, available from Willemstad. Anchorage: Only in consultation with Port Authority. Mooring information: Vessels dock with their port side to the piers, thus allowing passengers to disembark directly on the pier. Berths: There are two berths on the East side of the bay, with depths of 13.7m. Cargo Facilities: If cargo operations are required, lighters and stevedorers can be transported from Willemstad. Storage Facilities: No storage facilities available. Bunker Facilities: No bunker facilities available, fuel can be supplied by barge from Willemstad; water can be supplied. Ballast/slop reception: No facilities available, reception ex-barge can be arranged. No depth limit, Max. 350,000 dwt. 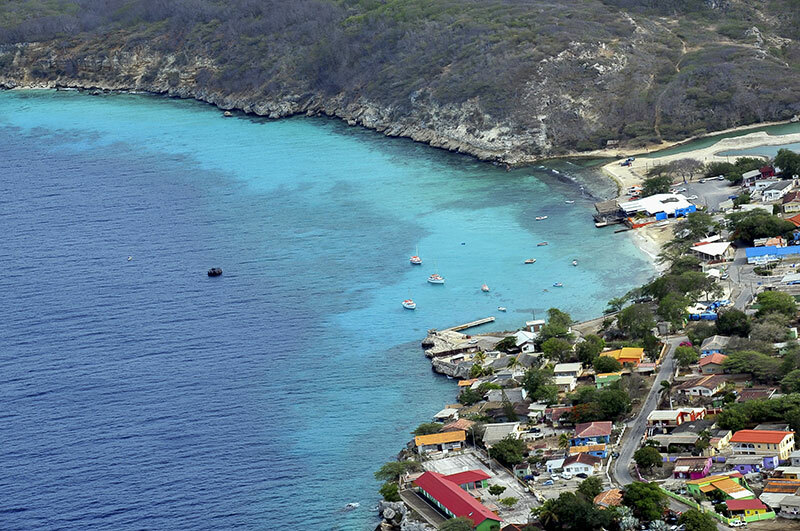 St. Michiel’s Bay is located on the South coast of Curaçao, 8km West of Willemstad. Curaçao Ports Authority owns the single mooring buoy at St. Michiel’s Bay, a sheltered, deep water bay with clear, safe waters. The buoy is utilized as an anchoring facility for vessels with dangerous cargoes and is perfect for carrying out underwater cleaning and minor repairs. Availability of ship maintenance, repair supplies and companies, attractive harbor rates and close proximity to shore provide many advantages for the shipping industry. Pilot: Compulsory, available from Willemstad. Anchorage: Anchorage is obtained by securing stern to the mooring buoy (SMB). Tugs: Available from Willemstad. Under normal conditions: vessels up to 213m LOA, 1 tug and vessels over 213m, 2 tugs. Mooring information: Vessels are moored with their stern to the buoy. A bow anchor is used to keep the vessel head in deep water. Berths: No berths available. The SMB is 198m of the shoreline with a water depth of 39.6m. The buoy is 2.7m in height and 5.48m in diameter, chained to two shore anchors by means of 2X 120mm stud link chains and has two hooks to tie up the vessel. It is equipped with a load monitor. Cargo Facilities: A floating crane is available and lighters can work some cargo at the SMB. Repair and Maintenance: Repairs are affected by the use of barges, arranged via Willemstad. Bunker Facilities: No bunker facilities available. Barges: Several barges are available. Ballast/slop reception: Available by barge. Fuik Bay is located on the South coast of Curaçao, 11km SE of Willemstad. 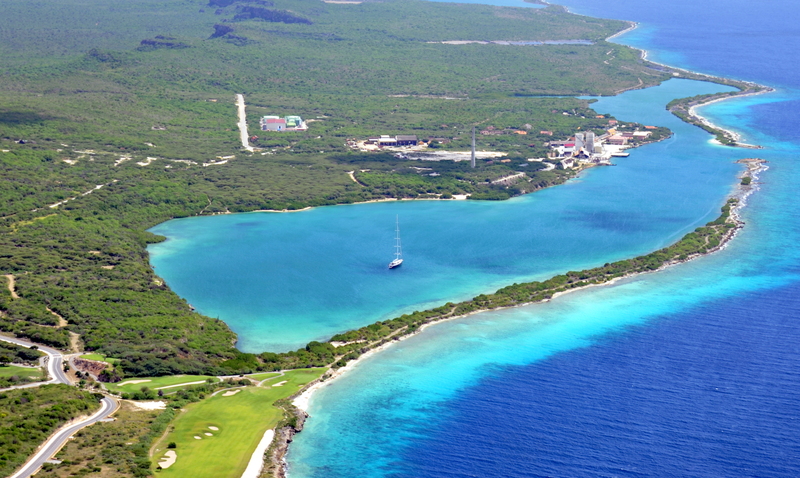 The Bay is a private bay owned by the Mining Company of Curaçao. This bay is mainly used as a loading terminal by the Mining Company of Curaçao for shipment of phosphate rock. Fuik Bay is near the popular St. Barbara Beach Resort and the Spanish Water, where yachting and aquatic sports are very popular. Pilot: Compulsory, pilots are provided from Willemstad. Anchorage: There is an anchorage area to the West side of the bay in depths up to 15m. Principal Navigation aids: Fuik Bay is a navigable bay with an entrance width of 44.8m and a depth of 7.92m. From a position SSW of the harbor, Newport leading beacons (Lat 12°03.1’N, Long 068°50.0’W) in line bearing 027.5° lead through the entrance channel in a depth of 8.6m. Berths: There are two berths at Fuik Bay, the phosphate wharf and ‘zandsteiger’. At the phosphate wharf, phosphate rock shipments take place using a conveyer and loading tower with a 8.53m fixed arm (loading rate 150tph). At ‘zandsteiger,’ a 25.6m berth is used for explosives and general cargo. Depth alongside is 6.7m. Cargo Facilities: At ‘zandsteiger’ general cargo is handled. Storage Facilities: No transit sheds are available. Bunker Facilities: Fuel supply equipment available from Curoil; water truck delivery of fresh water. Ballast/slop reception: Available in Port of Willemstad.